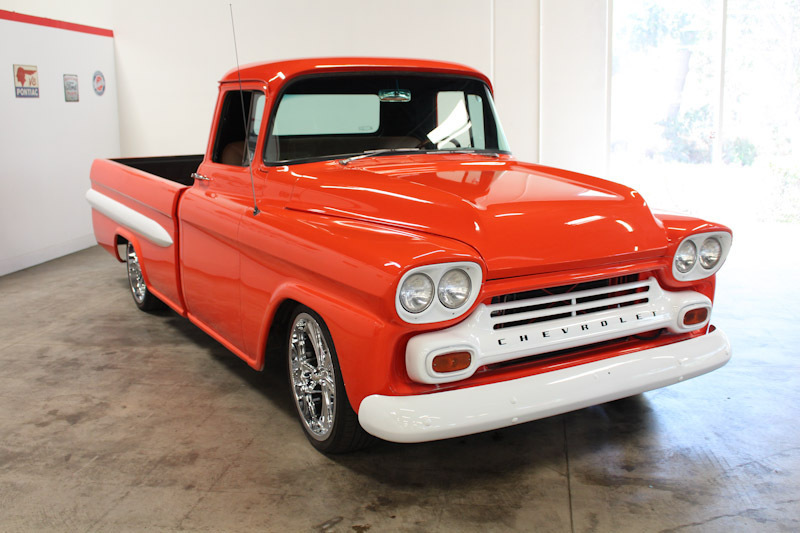 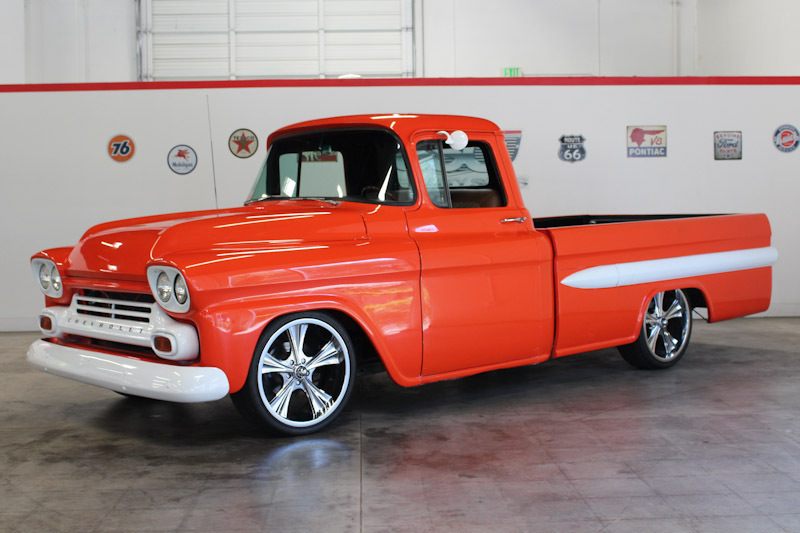 This 1959 Chevrolet 3100 1/2 Ton 2 Door LWB Pickup (Stock # F13320) is available in our Fairfield, CA showroom and any inquiries may be directed to us at 707-419-8200 or by email at Sales@SpecialtySales.com. 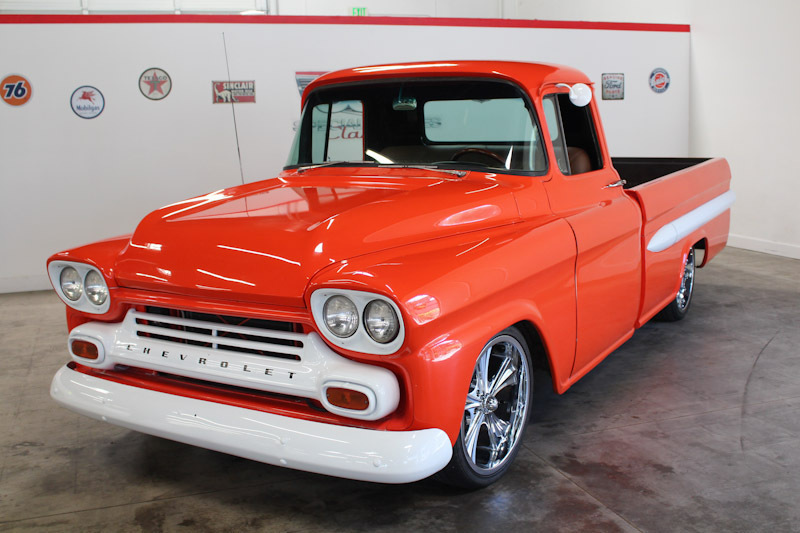 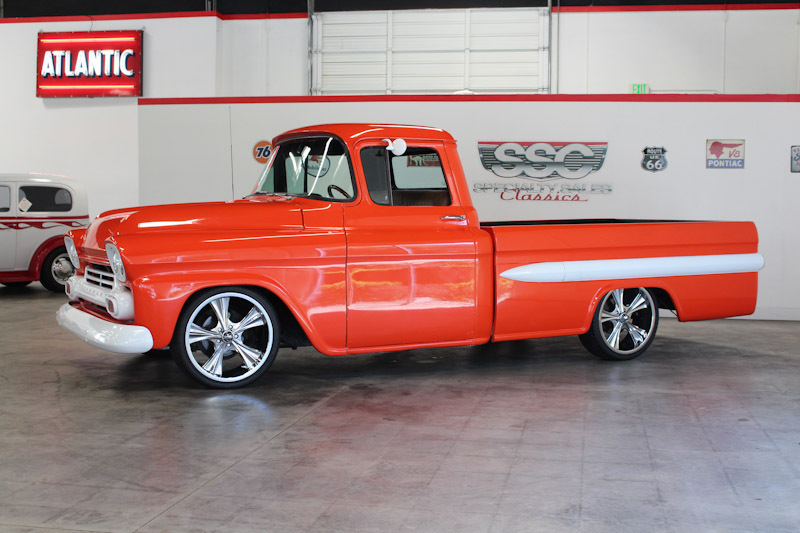 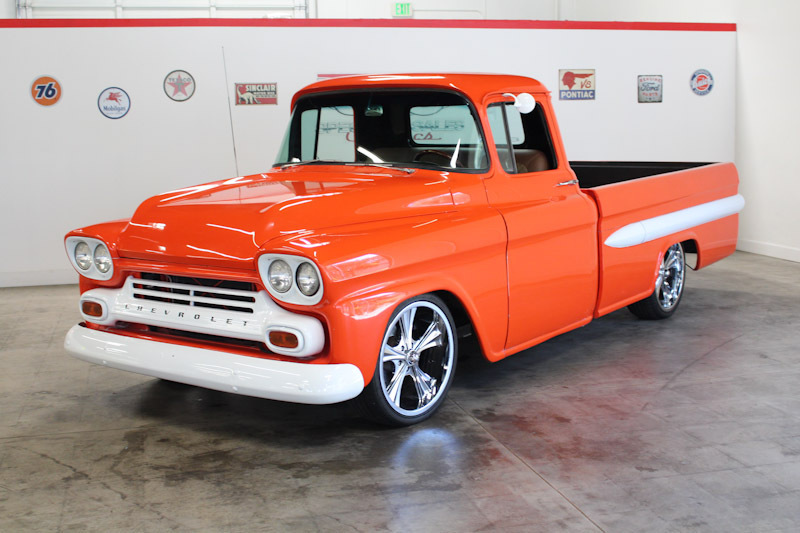 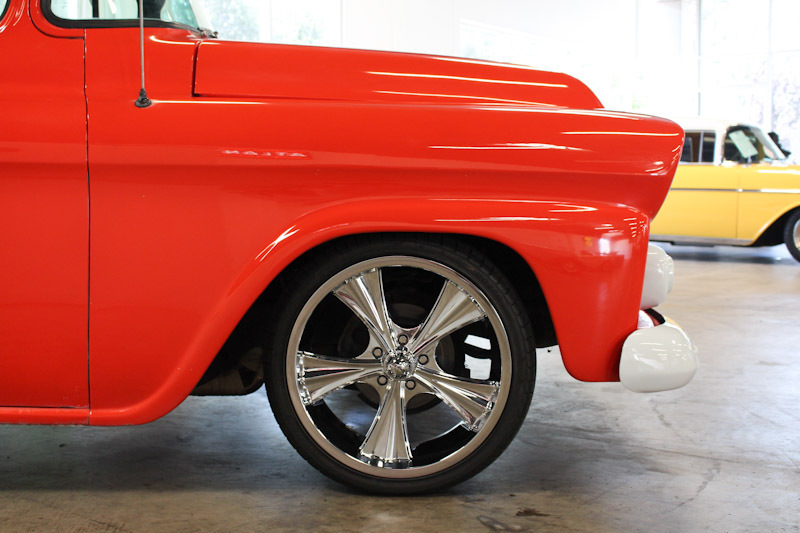 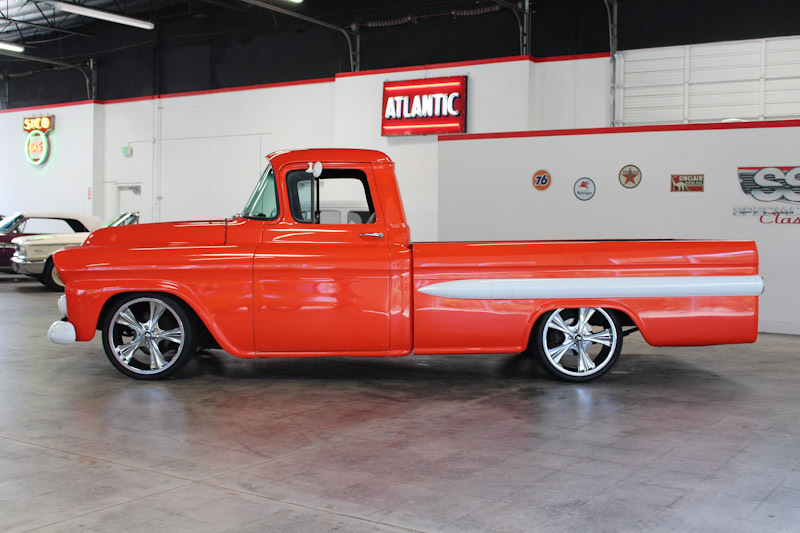 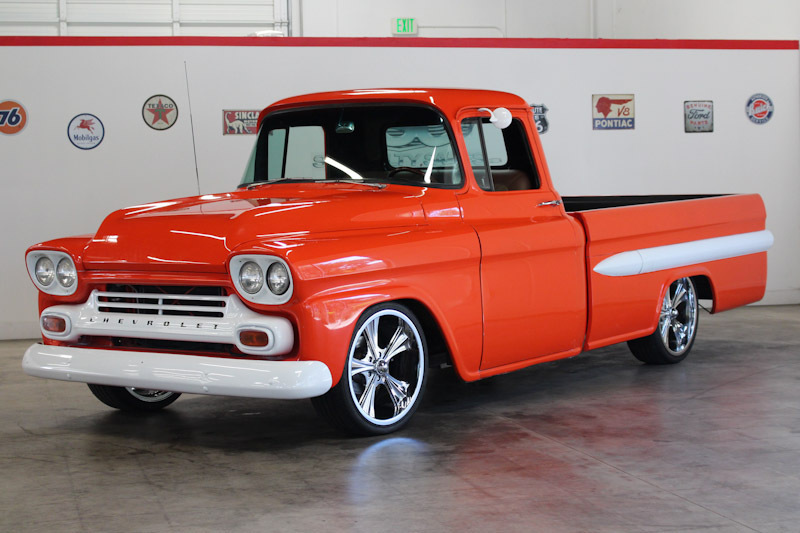 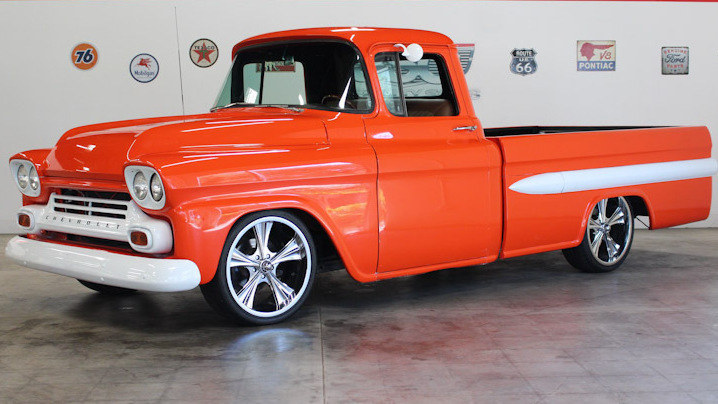 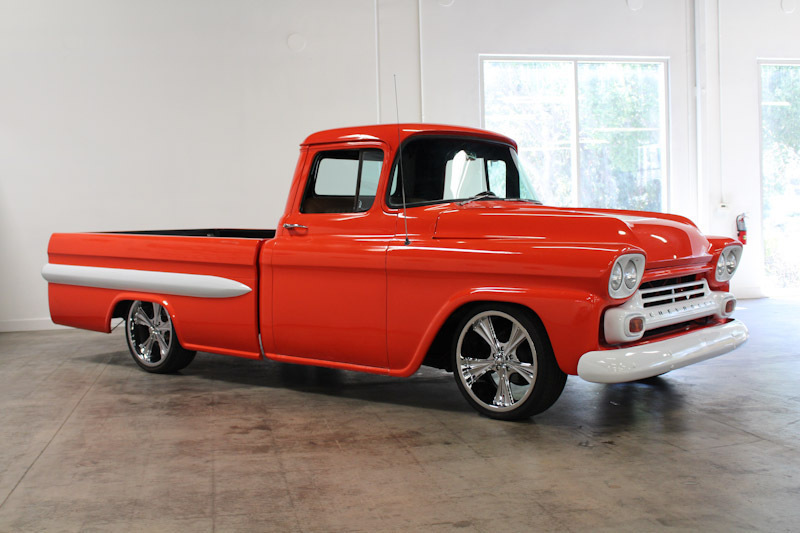 The next amazing classic up for grabs in our Fairfield showroom is this gorgeous 1959 Chevrolet 3100 1/2 Ton 2 Door LWB Pickup with Orange Pearl and White exterior paint, a gorgeous Oak hardwood bed w/ stainless spacers and a tan vinyl interior. 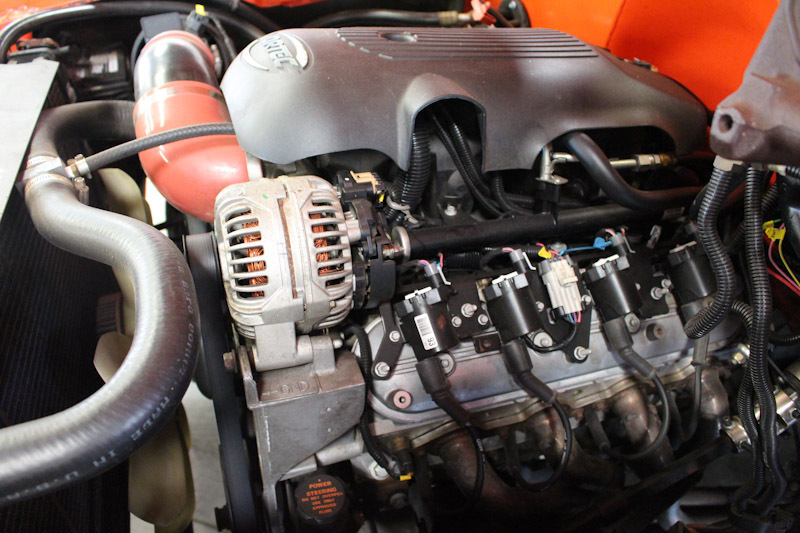 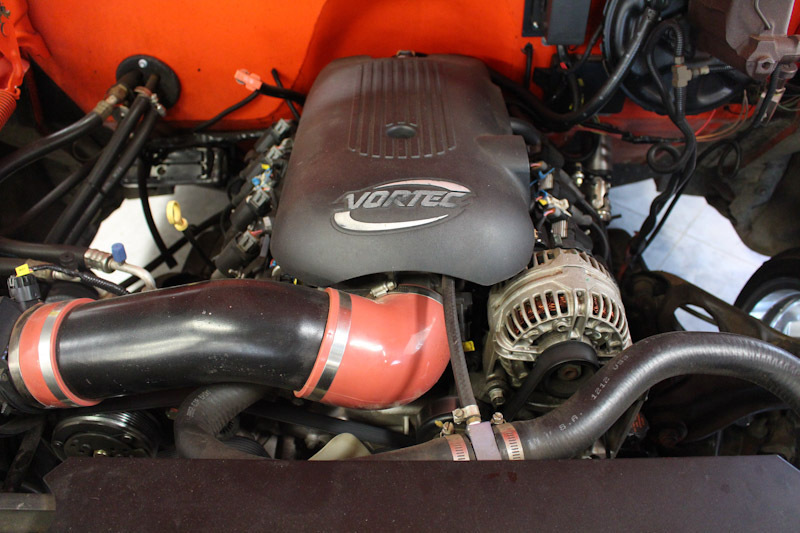 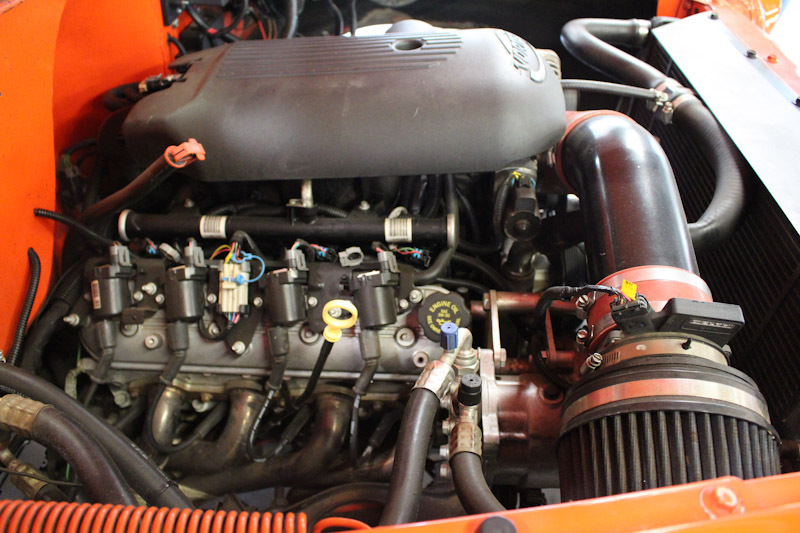 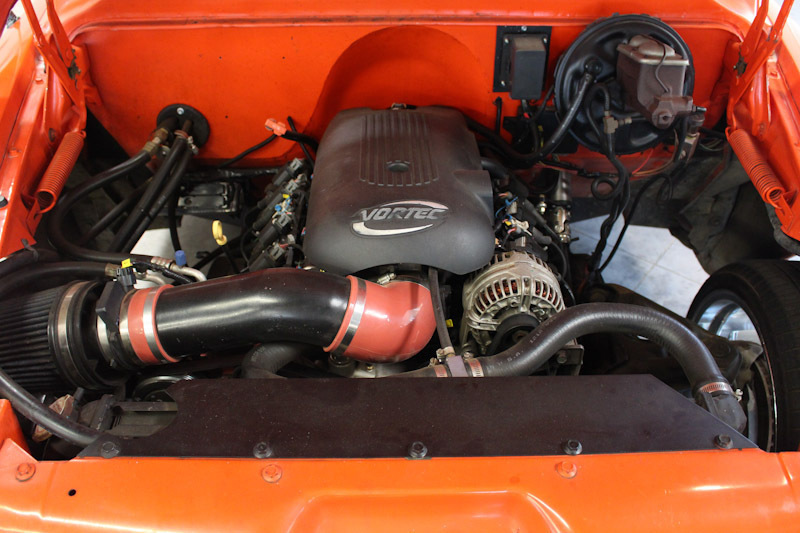 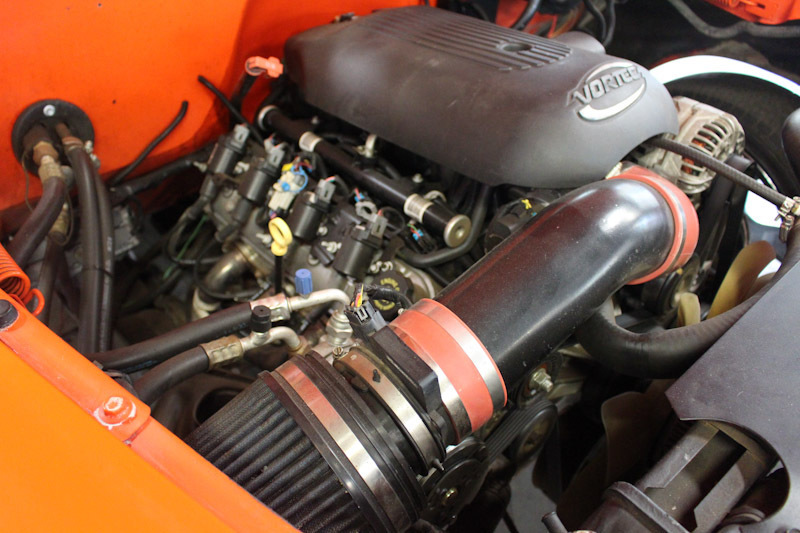 You’ll find a 5.3L V-8 engine out of a ’05 Tahoe under the hood with stainless headers and a new exhaust, a Camaro front clip, a Posi rear end and a 4L60E automatic overdrive transmission. 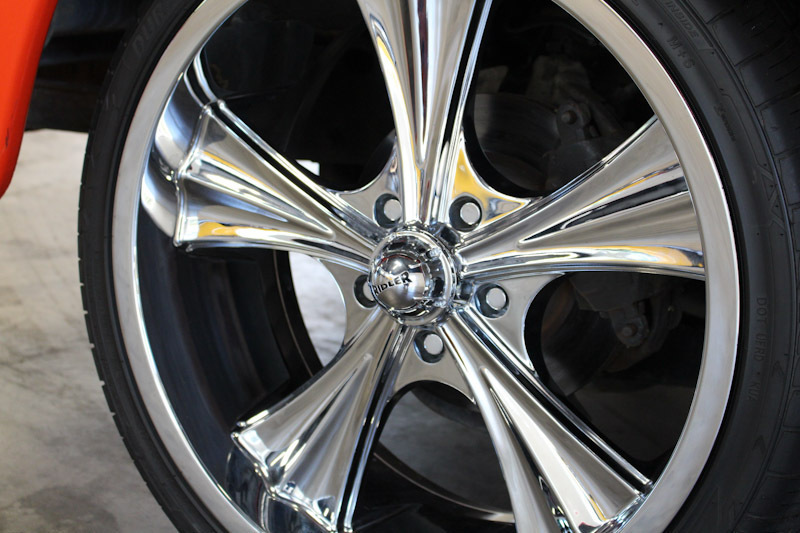 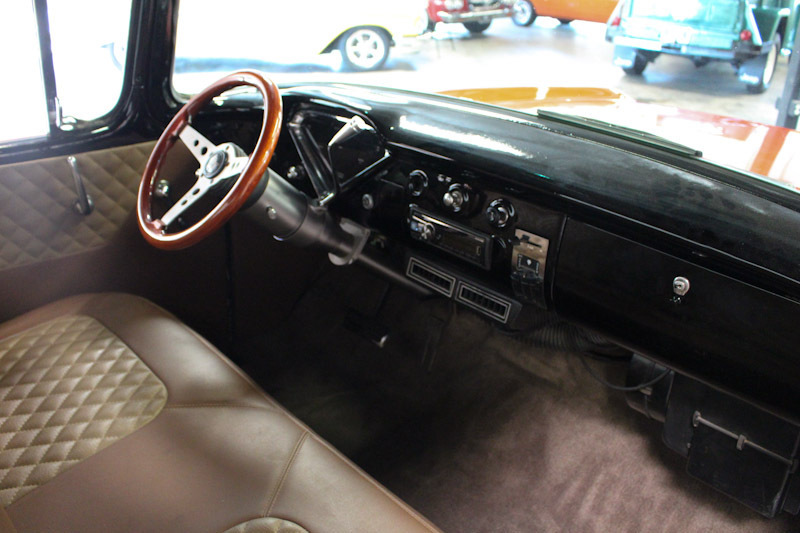 You’ll also find 4-wheel disc brakes, ice cold A/C, digital gauges, 20” wheels/tires, a 20 gallon Stainless fuel cell and so much more. 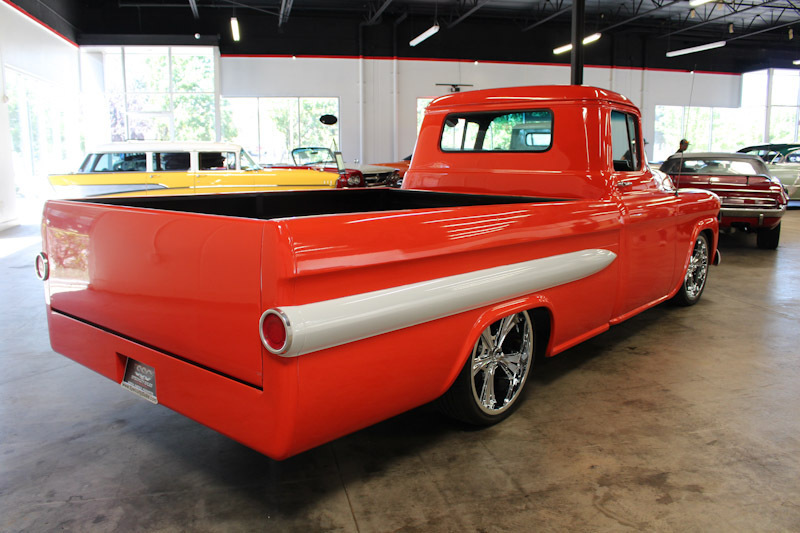 This awesome custom pickup has to be seen in person to be truly appreciated because it’s in great overall condition. 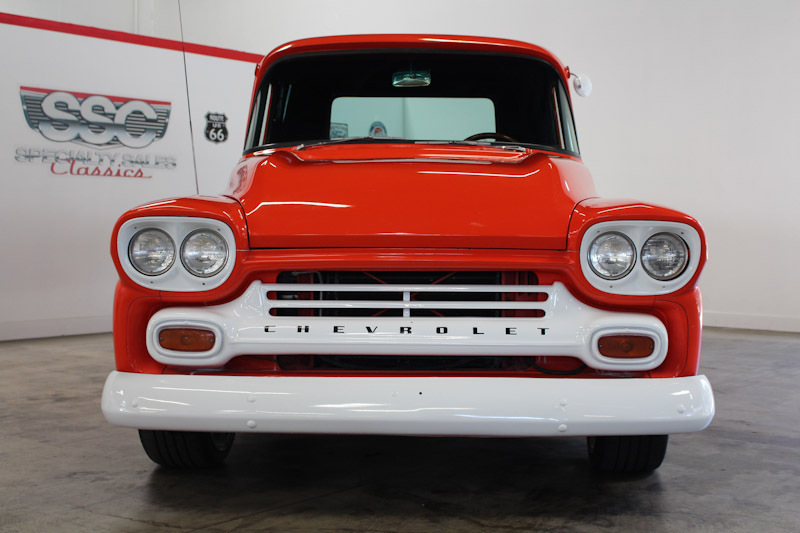 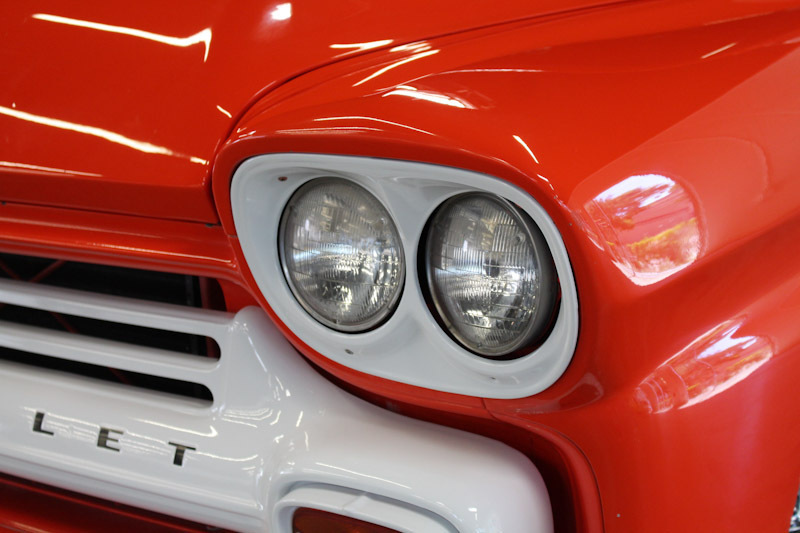 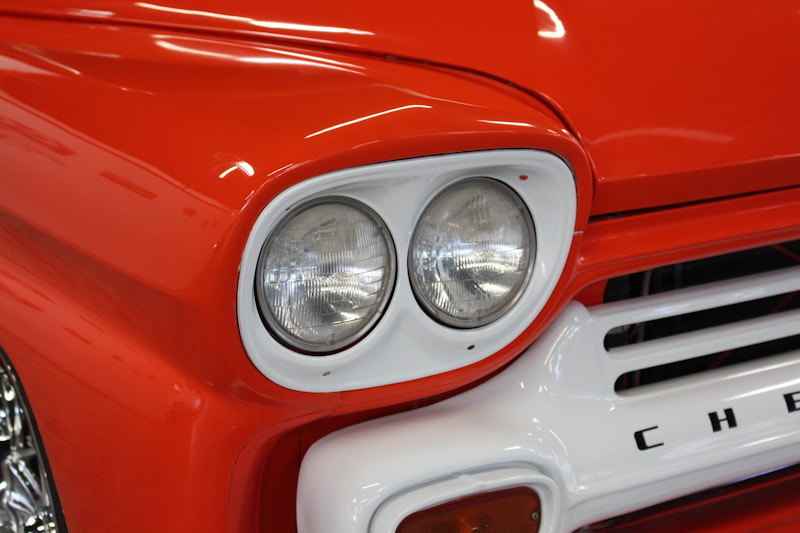 The current owner informs us that this 1959 Chevrolet 3100 1/2 Ton LWB Pickup is an older restoration that was completed approximately 8 years ago. 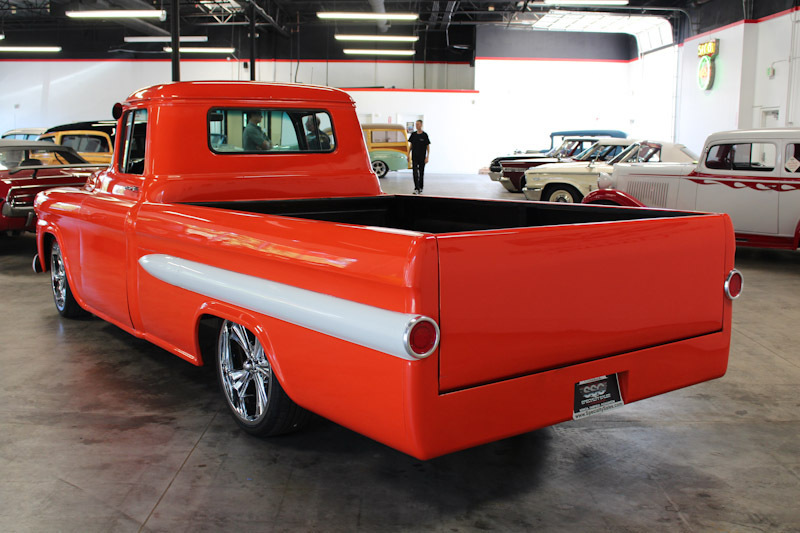 As you can see from the photographs, extensive planning went into this head-turner to make it both a show truck and an awesome performer. 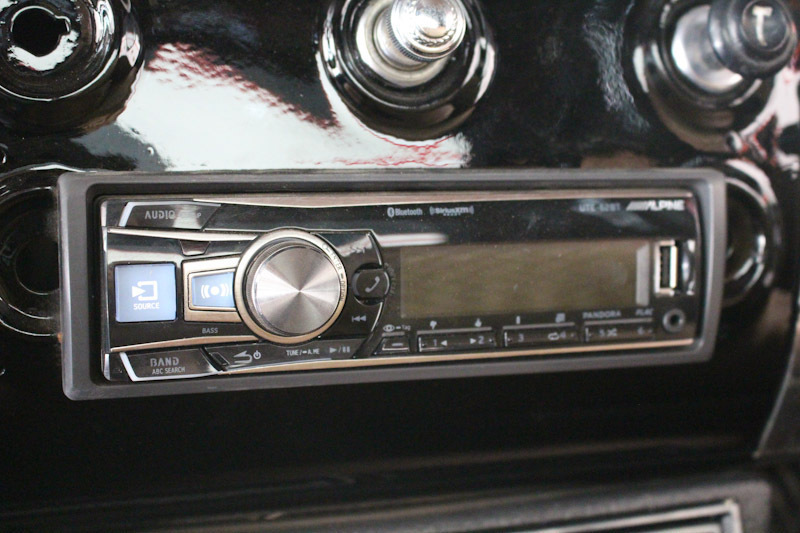 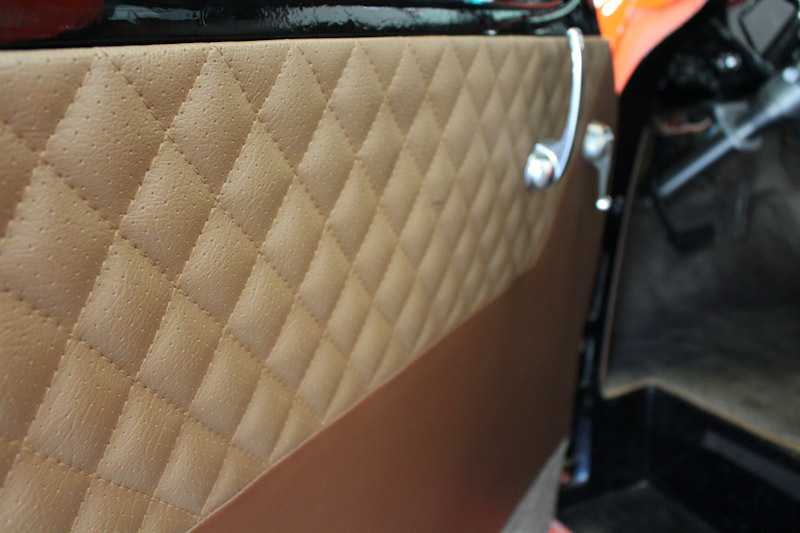 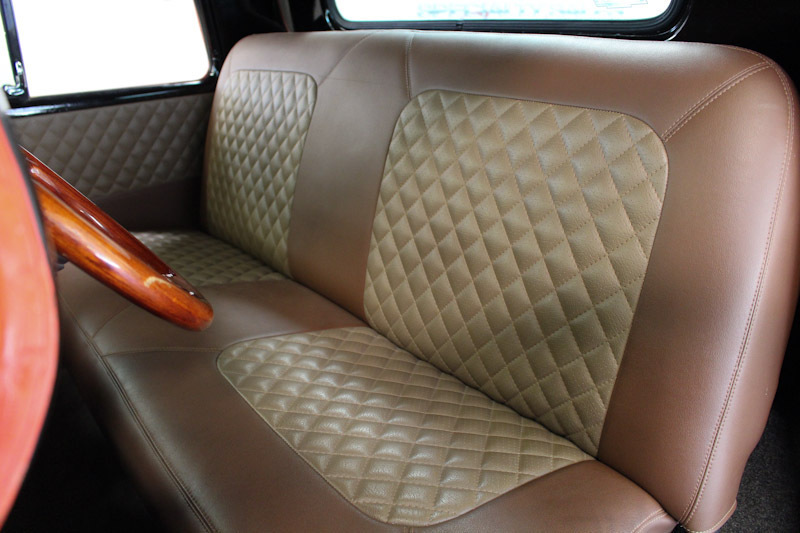 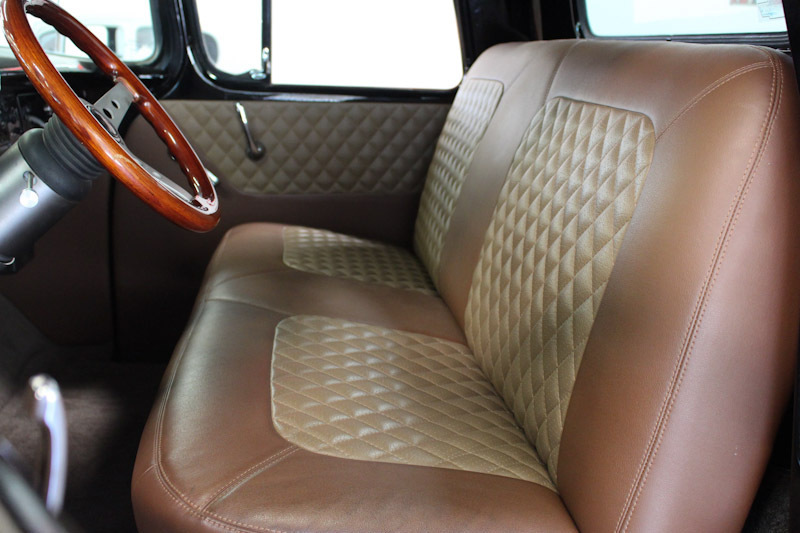 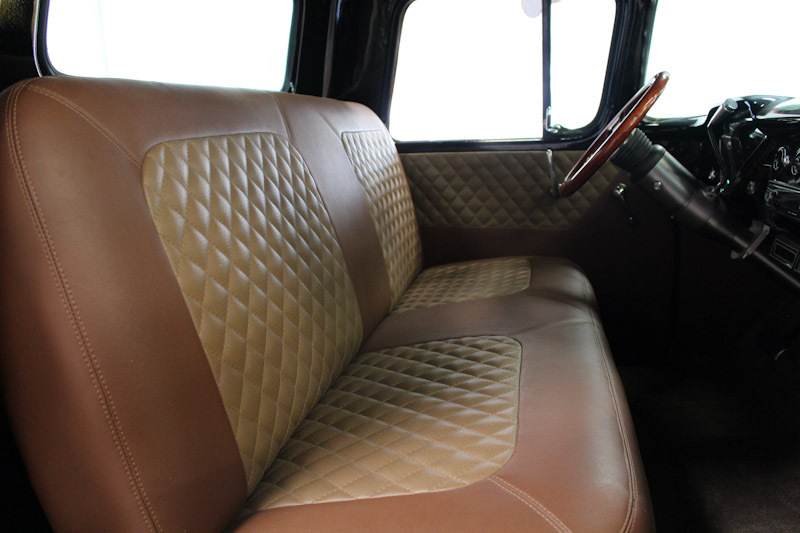 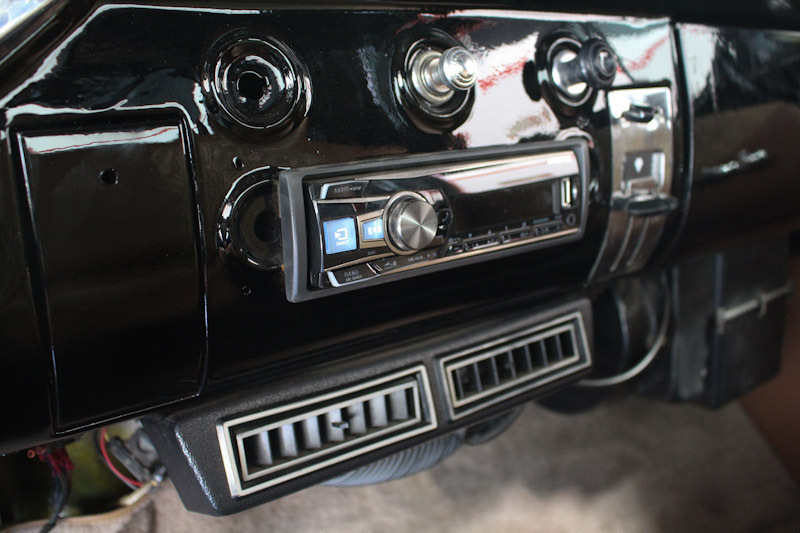 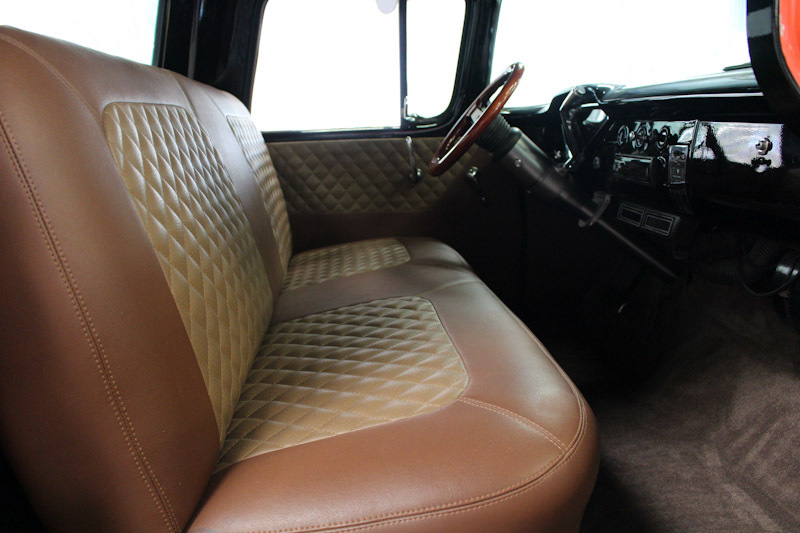 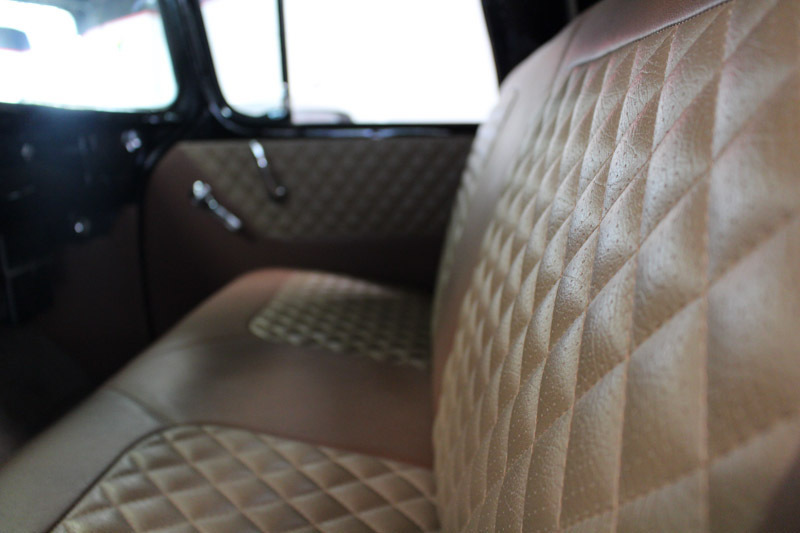 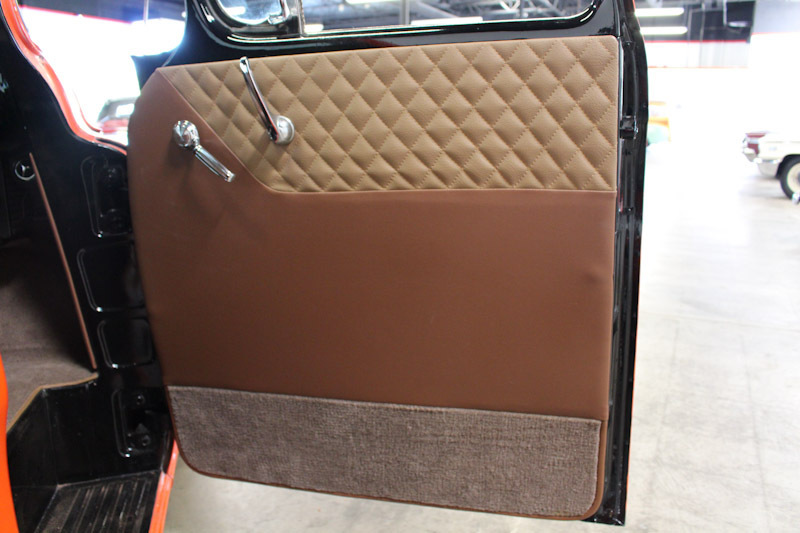 The custom interior features fresh black paint and diamond stitching on the seating, door panels and headliner, plus the carpeting and the digital gauges are also new. 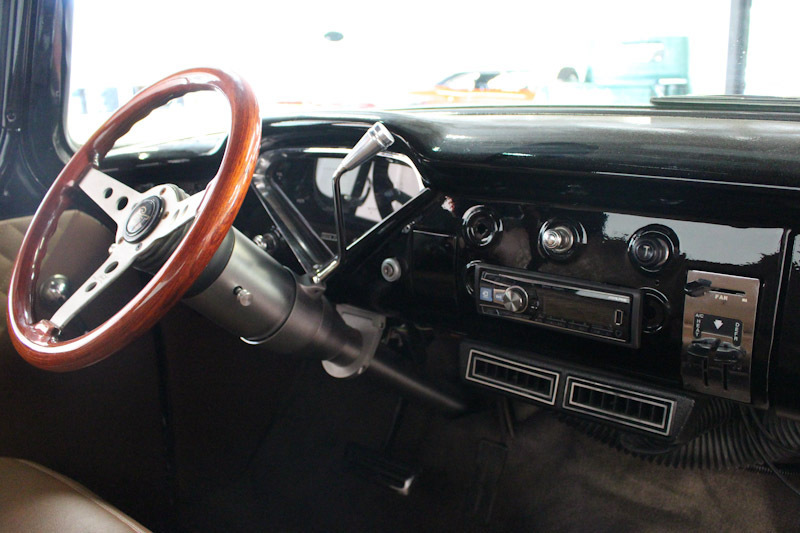 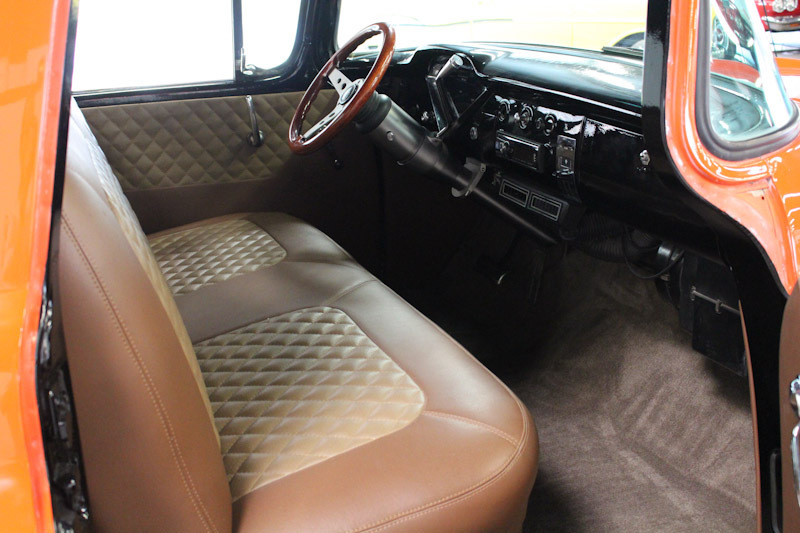 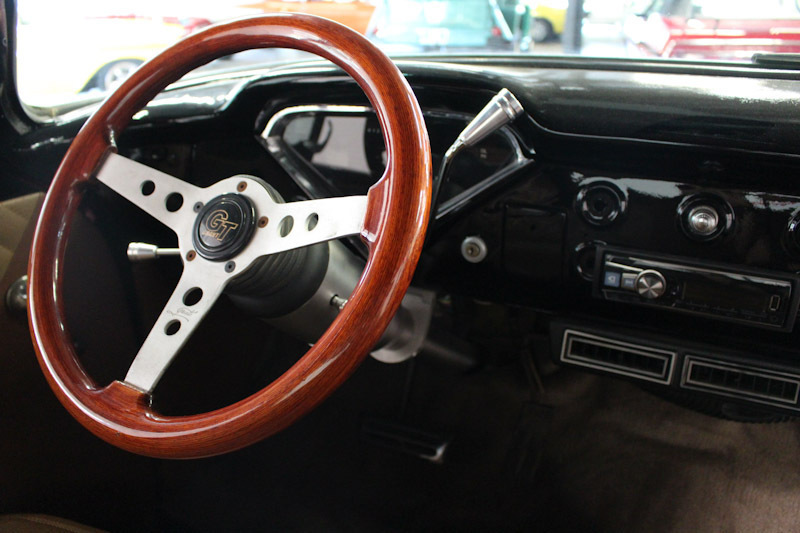 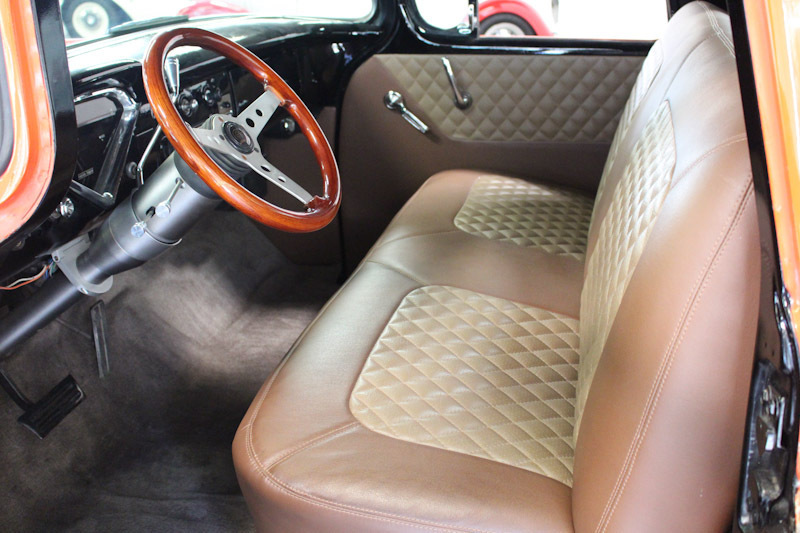 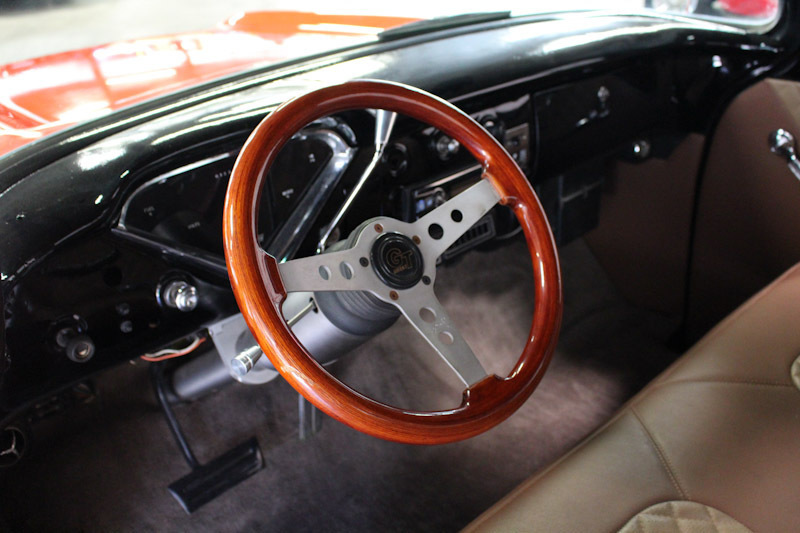 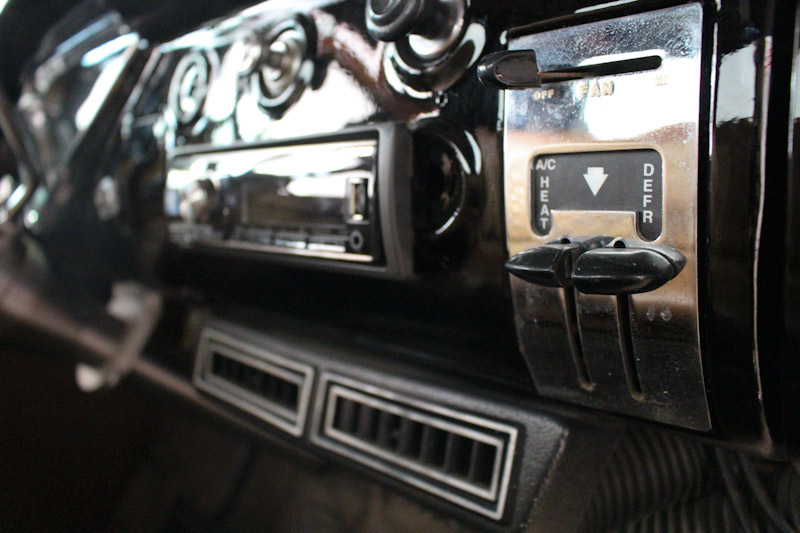 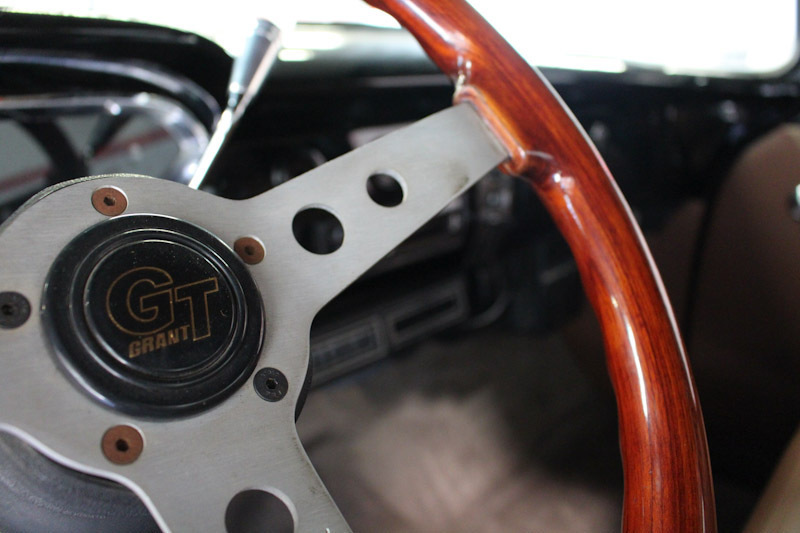 The owner also added a column shift and tilt steering wheel at that time to make this one a true pleasure to drive. 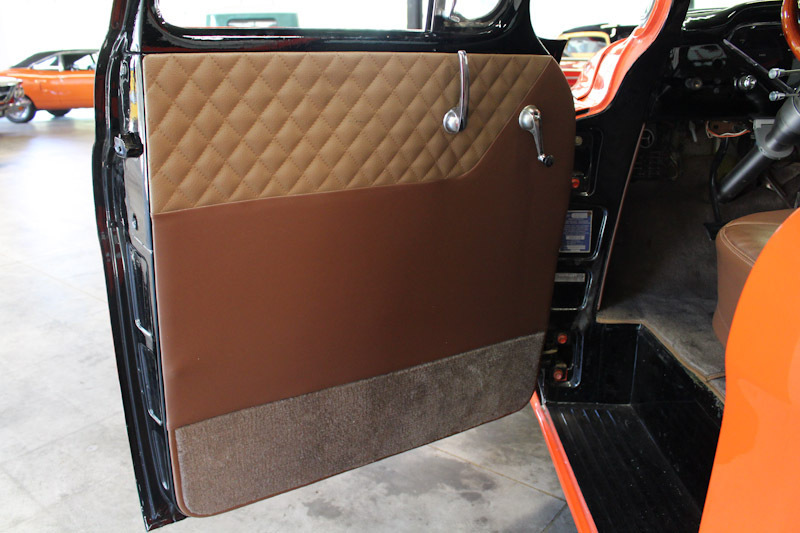 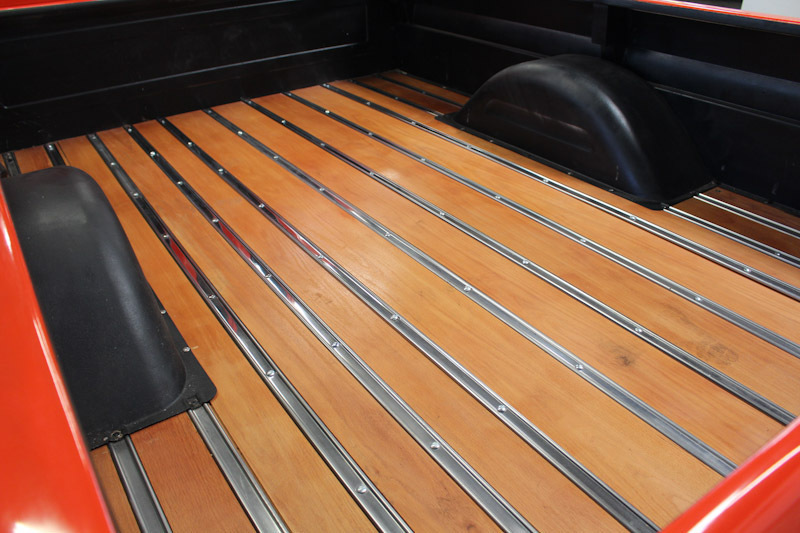 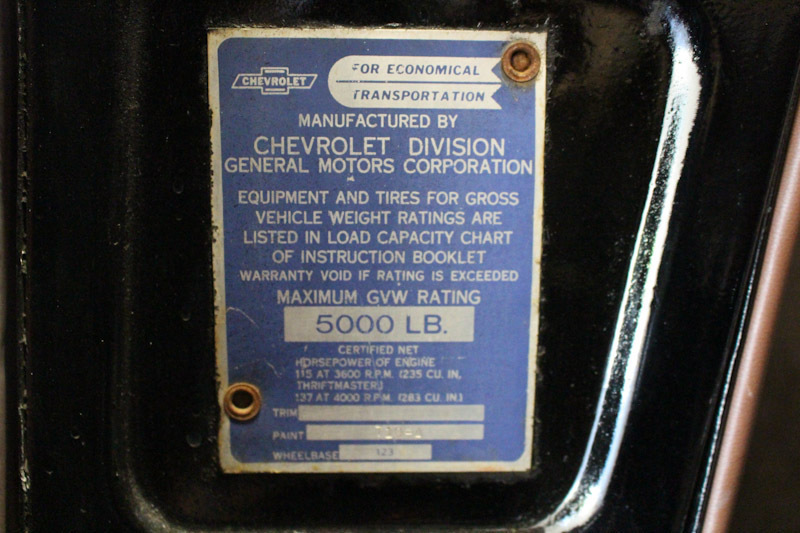 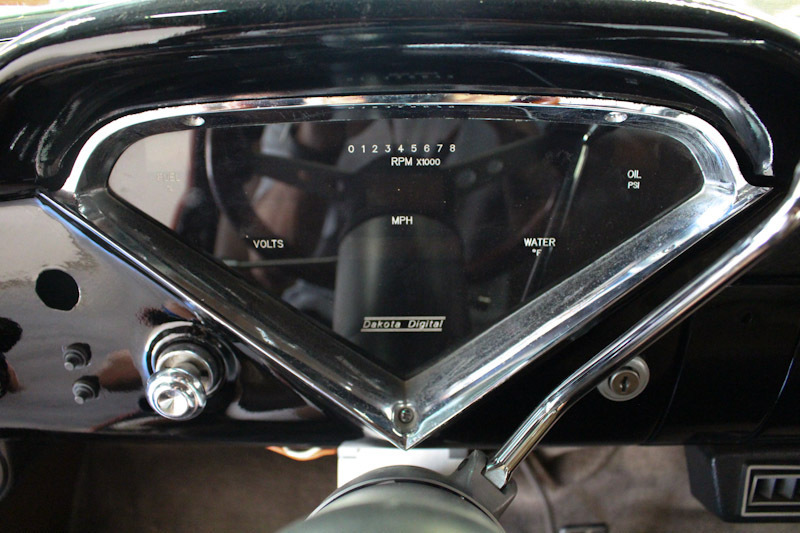 Additionally, this 1959 Chevrolet 3100 long wheel base pickup received all new wiring during the frame off restoration and a stand-alone harness to control the new motor. 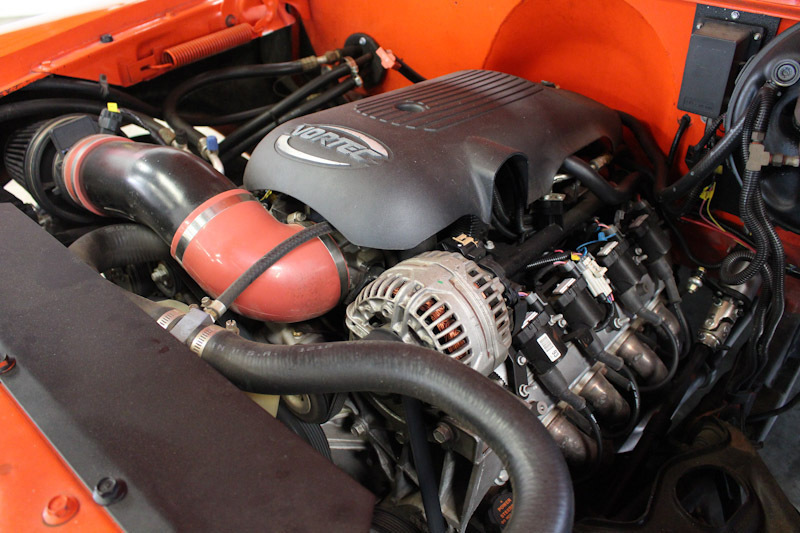 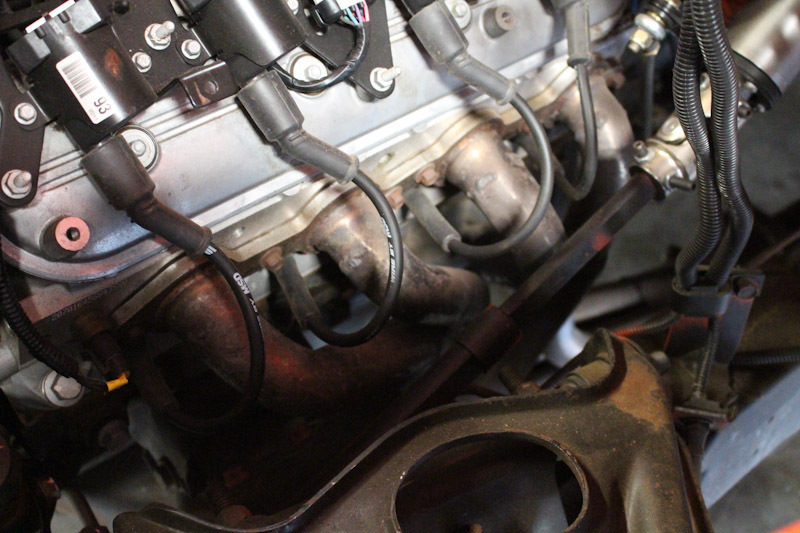 There’s around 2,500 total miles on the build so it really doesn’t need much- it has great acceleration and handling with just as impressive stopping power. 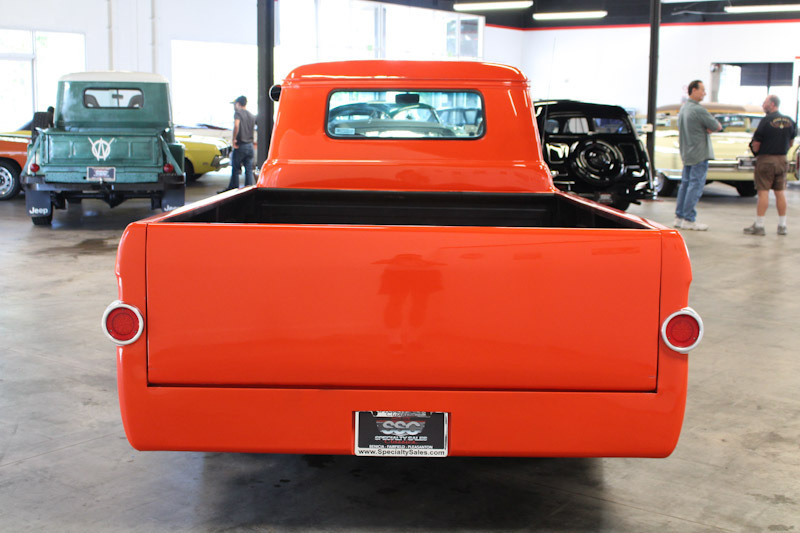 The new exhaust on this pickup also sounds awesome and it cruises on the highway at 70 MPH just as well as any modern pickup. 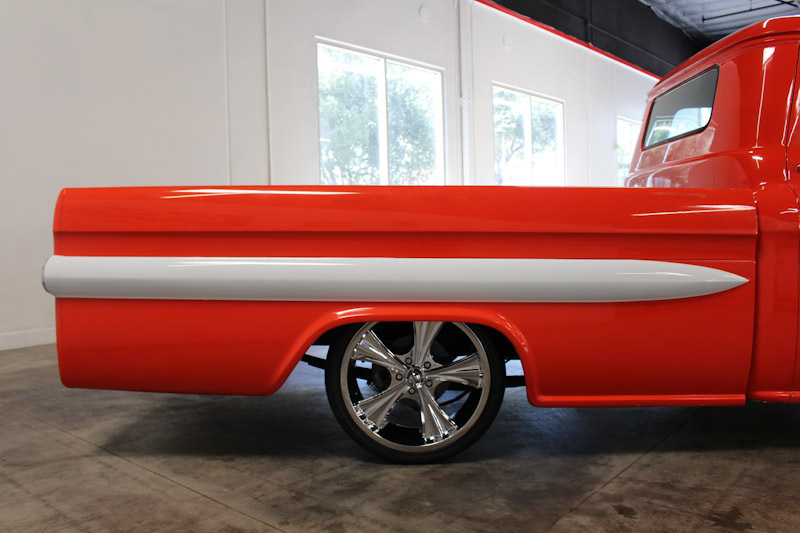 The A/C blows ice cold and with excellent performance, this one would make an exceptional display truck for a local CA business. 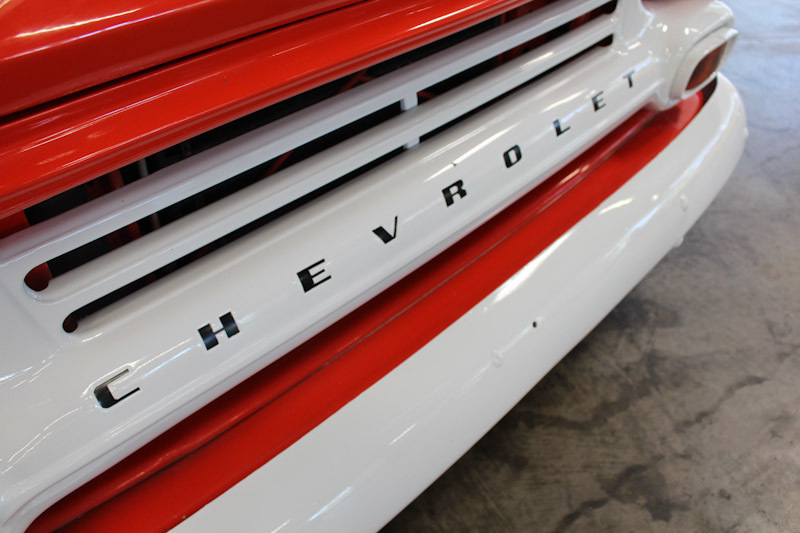 In terms of its present condition, the body of this 1959 Chevrolet 3100 Pickup is straight with decent quality paint and only a few visible dents/scratches. 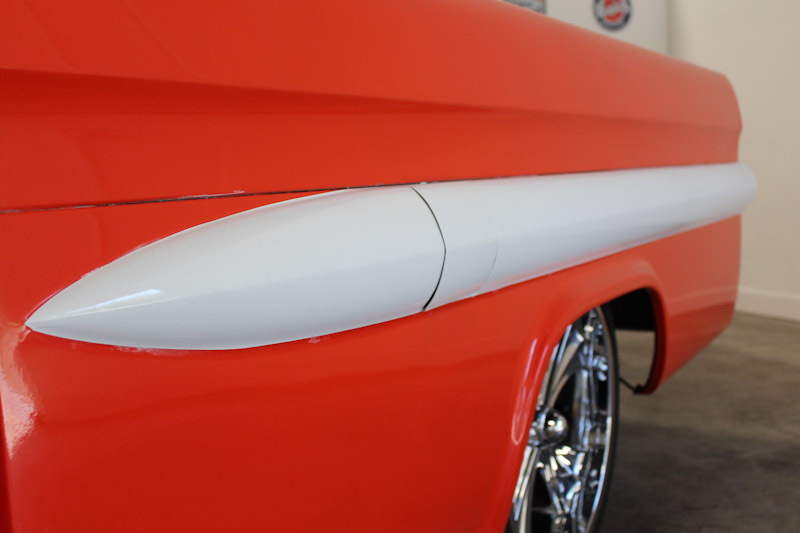 There are a few paint bubbles starting to form so this probably wouldn’t be consider a show quality example, yet it certainly still turns heads wherever it goes. 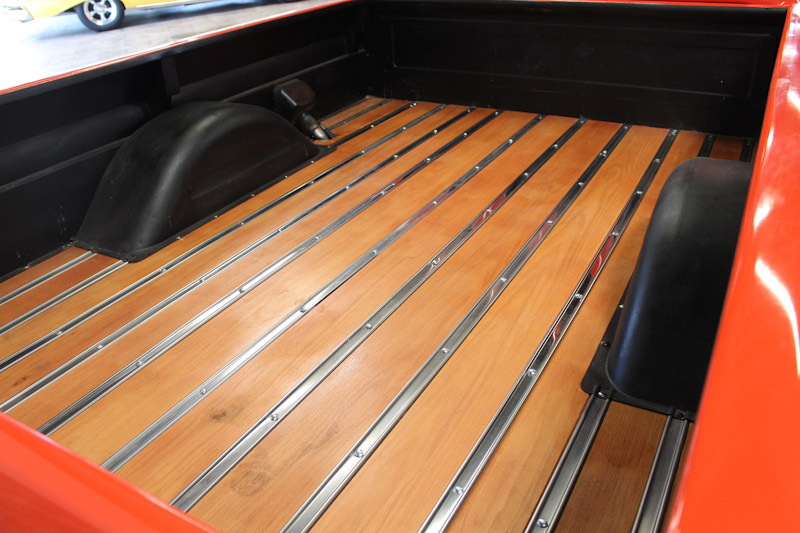 The Oak bed is particularly impressive with everything lining up beautifully and complimenting the high end interior. 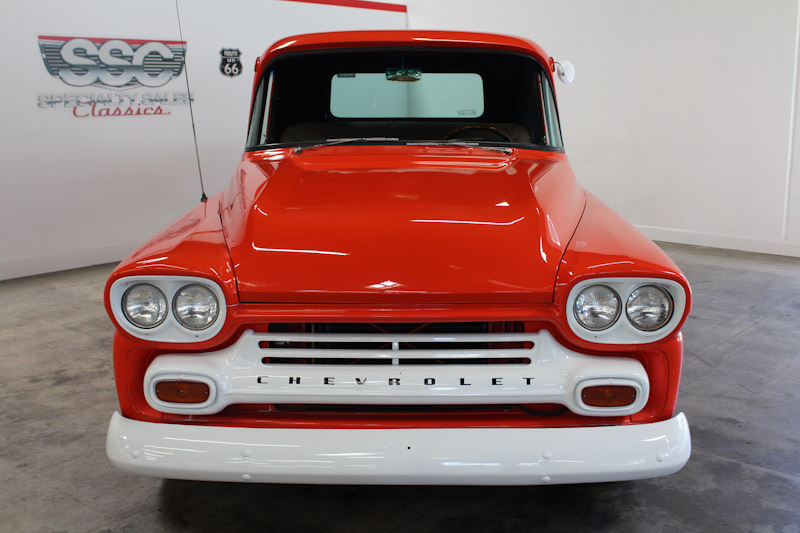 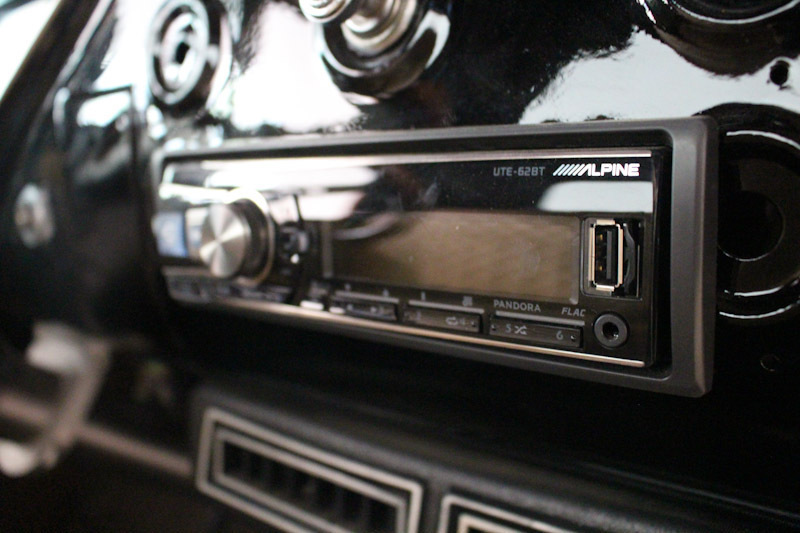 This is easily one of the best values we’ve seen in our showroom this year at the current asking price. 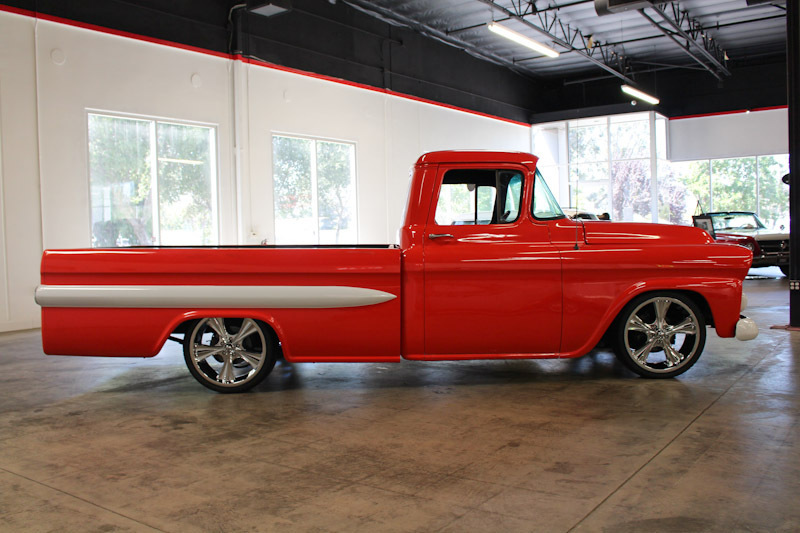 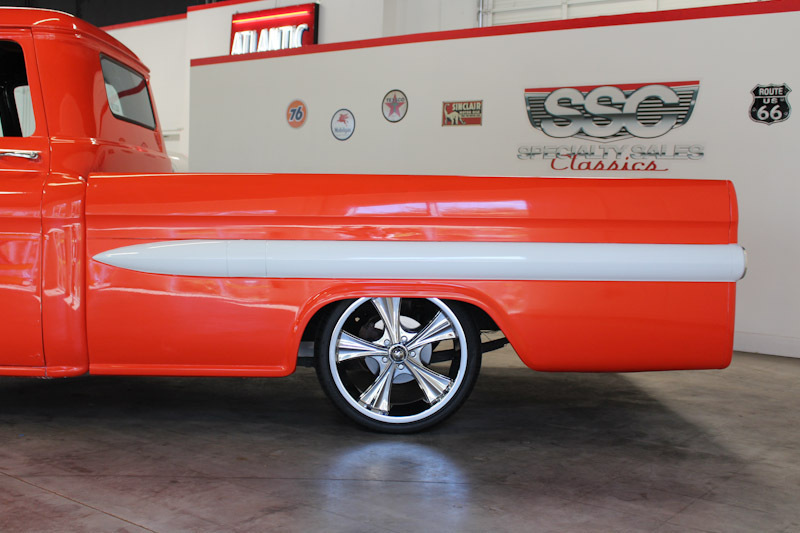 Overall, this highly customized 1959 Chevrolet 3100 Pickup is a fantastic custom build that’s definitely meant to be driven and enjoyed. 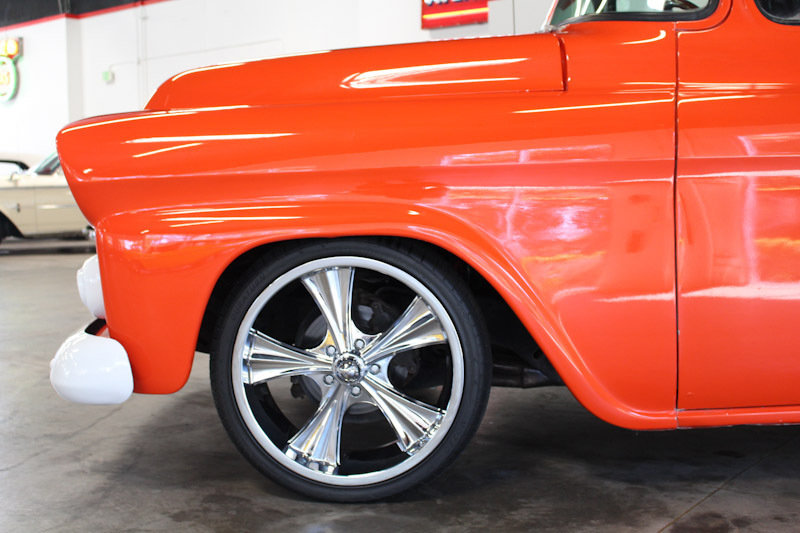 It must be seen in person to truly appreciate and there’s simply no way that this one remains available for long. 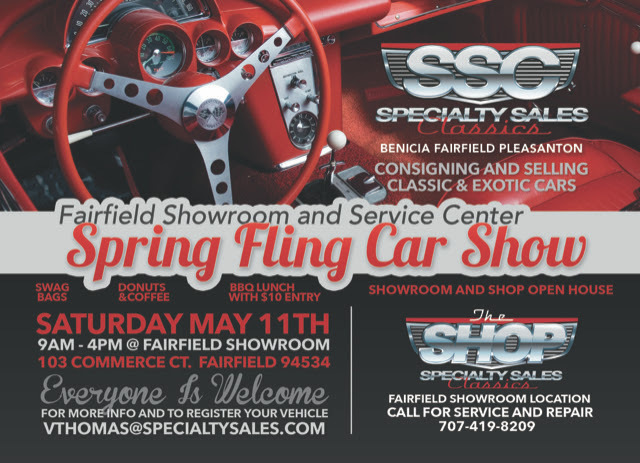 For more information about this vehicle, visit our Fairfield, California showroom, give us a call at 707-419-8200, or email us at Sales@SpecialtySales.com. 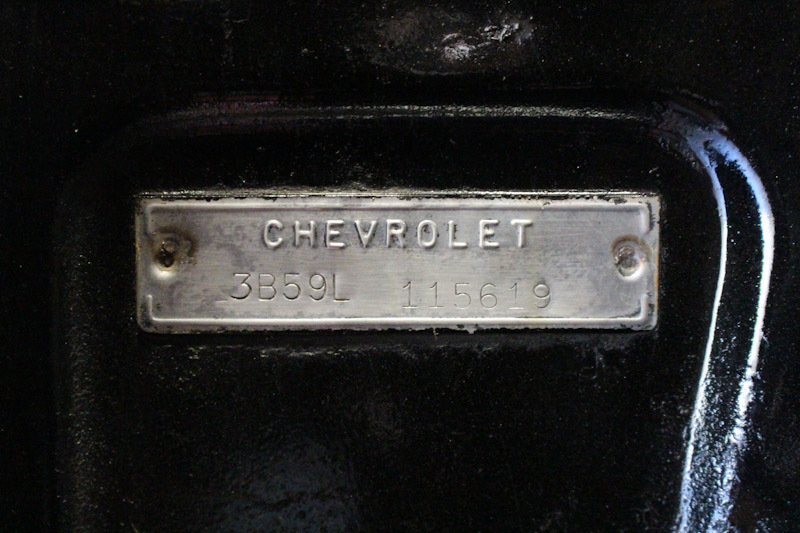 Be sure to mention Stock # F13320 as well.